The 1872 History/1873 Atlas of Lawrence County describes the "Slippery Rock Volunteers" as following: The uniform of the "Slippery Rock Volunteers" was a yellow linen hunting shirt, trimmed with red fringe; red leggings, a citizen's hat with a white plume. Each man furnished his own uniform and his own rifle, with which weapon the men were armed. William Stoughton was probably the first captain of this company, and Samuel Riddle also held the position for a time. After their name was changed to the "Washington Guards", they also changed their uniform to blue pants and coat, red sash, and cloth cap with a white plume. They had four gatherings annually: drill May 4th, review, May 12, and drill July 4th and September 10th. This company contained about one hundred men, and entered the service in 1861 with nearly that strength. And under the following officers, viz: Captain, Samuel Bentley; First Lieutenant, Andrew Nelson; Second Lieutenant, Norman Maxwell. They joined the One Hundredth or "Roundhead" regiment, and were mustered into the service as Company E of that body, and before the close of the war saw much severe service. When Captain Leasure applied to the Secretary of War for authority to raise an independent regiment among the yeomanry of central (author's note: and 'western') Pennsylvania, Cameron said, "Yes, Captain, if they will be men that will hold slavery to be a sin against God and a crime against humanity and will carry their bibles into battle". "I have no other kind to bring. ", responded the Captain. "All right," exclaimed General Scott who chanced to be present. "We will call them 'Roundheads". This was the motto of this fighting union regiment of the American Civil War 1861-1865. In the early part of the war when the regiment was part of the Port Royal, SC operations from November 1861 to July of 1862, the regiment had their own printing press. 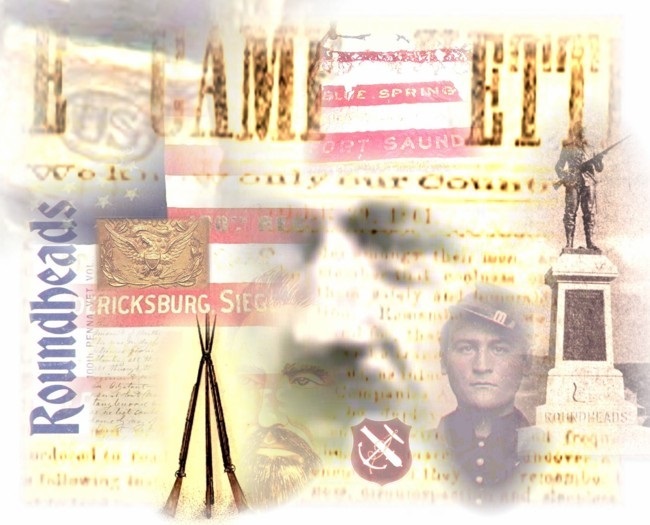 A regimental newspaper that was "published at every opportunity" was developed and titled The Camp Kettle. The motto, 'We know only our country' was prominent under the title of the newspaper. 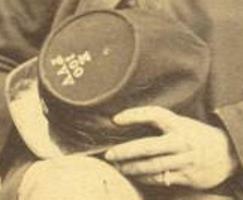 Copyright © 2013 Company E, 100th Regiment Pennsylvania Volunteer Infantry, "Roundheads". All Rights Reserved.